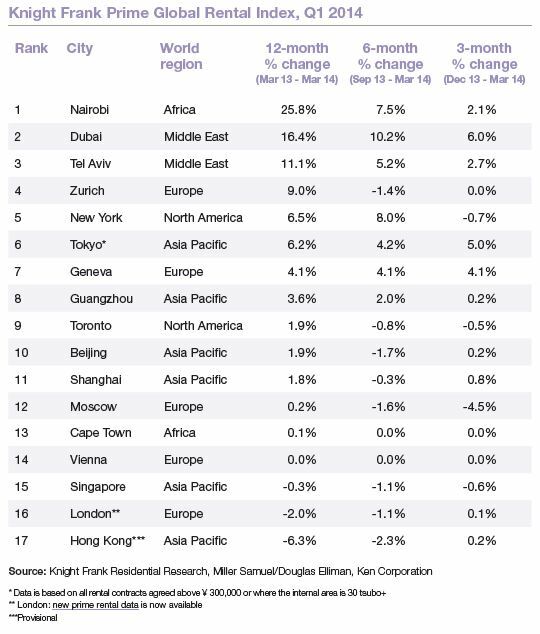 Prime residential rental growth in emerging markets such as Nairobi and Dubai continues to outpace that of the traditional financial centres of London and Hong Kong. Kate Everett-Allen examines the latest index results. Nairobi leads our annual rankings for the fourth consecutive quarter. Prime rents in the Kenyan capital increased by almost 26% in the year to March, but there are signs the market is cooling with growth of only 2.1% recorded in the first three months of 2014. 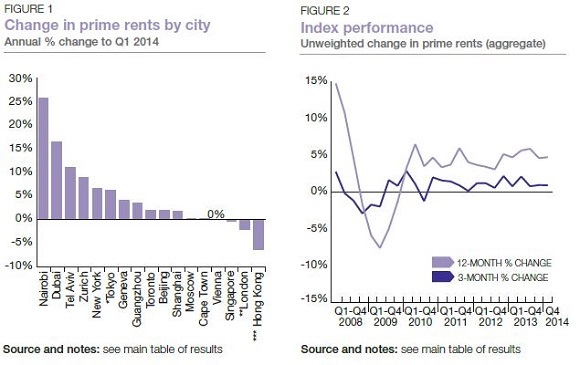 However, we expect prime rental growth in these key cities to strengthen over the remainder of 2014. In Hong Kong, although there has been a relaxation of the Double Stamp Duty rule, a number of stringent cooling measures remain in place. With foreign buyers facing purchase costs of 25% of the sales price, the luxury rental market is attracting those deterred from buying, which should help support future rental growth. Dubai and Tokyo recorded the strongest rates of growth with prime rents rising by 6% and 5% respectively in the first three months of the year. In Dubai, prime rents continue to outpace wage inflation. This is raising concerns about affordability and is leading domestic and expat buyers alike to consider purchasing a home. However, the introduction of a mortgage cap and higher transfer fees at the end of 2013 has led some to defer this decision. Whilst prime rents around the world rose by 4.7% in the year to March, they were outperformed by prime capital values which increased by 6.1% over the same period. We expect the gap to narrow as corporate tenant demand – a key driver of prime rents – strengthens on the back of improving economic and business sentiment. 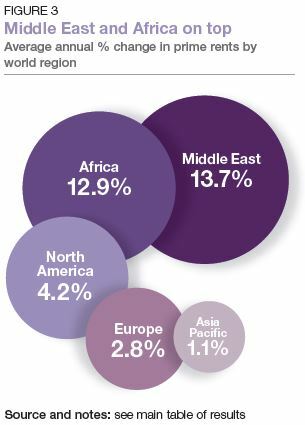 The key risks for the world’s sales markets could emerge as catalysts for growth in terms of prime rents. The withdrawal of stimulus, along with the expected rise in interest rates in influential economies such as the US and the UK, is likely to boost rental demand as mortgage costs rise over time. The Knight Frank Prime Global Rental Index is an important resource for investors and developers looking to monitor and compare the performance of prime residential rents across key global cities. Prime property corresponds to the top 5% of the mainstream housing market in each city. The index is compiled on a quarterly basis using data from Knight Frank’s network of global offices and research teams.